Ground beef, beef mince, minced beef, minced meat is a ground meat made of beef that has been finely chopped with a large knife or a meat grinder. It is used in many recipes including hamburgers and spaghetti bolognese. In some parts of the world, meat grinders are called mincers. In many countries, food laws define specific categories of ground beef and what they can contain. For example, in the United States, beef fat may be added to hamburger but not to ground beef if the meat is ground and packaged at a USDA-inspected plant. [note 1] In the U.S., a maximum of 30% fat by weight is allowed in either hamburger or ground beef. The allowable amount in France is 5 to 20% (15% being used by most food chains). In Germany, regular ground beef may contain up to 15% fat while the special "Tatar" for steak tartare may contain less than 5% fat. Both hamburger and ground beef can have added seasoning, phosphate, extenders, or binders added; but no additional water is permitted. Ground beef is often marketed in a range of different fat contents to match the preferences of customers. Ground beef is generally made from the less tender and less popular cuts of beef. Trimmings from tender cuts may also be used. Skeletal tissue: "Bone and cartilage, observed in some brands, were not expected; their presence may be related to the use of mechanical separation in the processing of the meat from the animal. Small amounts of bone and cartilage may have been detached during the separation process." Peripheral nerve tissue. Brain tissue was not detected in any of the samples. Adipose tissue—"The amount of lipid observed was considerable and was seen in both adipose tissue and as lipid droplets. Lipid content on oil-red-O staining was graded as 1+ (moderate) in 6 burgers and 2+ (marked) in 2 burgers." Plant material: "was likely added as a filler to give bulk to the burger"
Ground beef is popular as a relatively cheap and quick-cooking form of beef. Some of its best-known uses are in hamburgers, sausages and cottage pies. It is an important ingredient in meatloaf, sloppy joes, tacos, and Midwestern cuisine. Italians use it to make meat sauces, for example, lasagna and spaghetti bolognese. In the Middle East, it is used to make spicy kofta and meatballs. The Scottish dish mince and tatties uses it with mashed or boiled potatoes. In Lancashire, particularly Oldham, minced meat is a common filling for rag pudding. The Dutch slavink consists of ground beef (half beef, half pork) rolled in bacon. 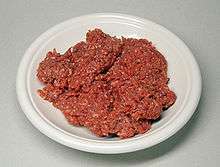 Raw, lean, ground beef is used to make steak tartare, a French dish. More finely diced and differently seasoned, it is popular as a main course and as a dressing in Belgium, where it is known as filet américain ("American fillet"). Picadillo is a Spanish term for ground beef, and is a common ingredient in several Latin American cuisines. Picadillo with chili pepper and finely diced onion and potato is a common filling for tacos and gorditas in Mexico. Food safety of ground meat issues occur because of the possibility of bacterial contamination. Undercooked hamburgers contaminated with E. coli O157:H7 were responsible for four deaths and the illness of hundreds of people in the U.S. in 1993. Ground beef must be cooked to 72 °C (160 °F) to ensure all bacterial contamination—whether it be endogenous to the product or contaminated after purchasing by the consumer—is killed. Ths color of cooked meat does not always indicate the beef has reached the required temperature; beef can brown before reaching 68 °C (155 °F). To ensure the safety of food distributed through the National School Lunch Program, food banks, and other federal food and nutrition programs, the United States Department of Agriculture has established food safety and quality requirements for the ground beef it purchases. A 2010 National Research Council report reviewed the scientific basis of the Department’s ground beef safety standards, compared the standards to those used by large retail and commercial food service purchasers of ground beef, and examined ways to establish periodic evaluations of the Federal Purchase Ground Beef Program. The report found that although the safety requirements could be strengthened using scientific concepts, the prevention of future outbreaks of foodborne diseases will depend on eliminating contamination during production and ensuring meat is properly cooked before it is served. ↑ These rules only apply to meat being sold across state lines. In the U.S., much ground beef is produced at local grocery stores and is not sold across state lines. In these cases the laws of the local state apply; state laws can have the same or different requirements. ↑ "Ground Beef and Food Safety". Fsis.usda.gov. 2013-08-06. Retrieved 2015-11-11. ↑ "Fast food hamburgers: what are we really eating?" (PDF). Retrieved 2014-04-08. 1 2 3 4 5 6 7 Michael Moss (2009-12-31). "Safety of Beef Processing Method Is Questioned". NY Times. Retrieved 2015-11-11. ↑ "Case Study: Jack in the Box E. coli crisis". Ou.edu. Retrieved 2014-04-08. ↑ "An Evaluation of the Food Safety Requirements of the Federal Purchase Ground Beef Program (2010) : Division on Earth and Life Studies". Dels.nas.edu. Retrieved 2015-11-11. ↑ "Division on Earth and Life Studies". Dels.nas.edu. Retrieved 2015-11-11.